Recoverable plastics coming from domestic waste end up mostly in landfills. Strong polymer chains in plastic are extremely resistant to natural bio degradation processes. Therefore landfills are overloaded with plastic wastes shortening lifespan of these landfills. Since many municipalities or garbage collection companies are realizing value in garbage, sorting facilities sector is growing up to recover packaging waste. But plastics which recovered from domestic waste are highly contaminated with organic waste. Another important source for recoverable plastics are agricultural sector. Plastics coming from end of use waste in agriculture such as greenhouse covers, irrigation pipes create thousand of tons of waste plastics every year. These plastics waste also contain contaminants, such as dirt, sand, mud etc. There are many other sectors creating tons of waste plastics which can be recovered. For recovering these kind of plastics, plastic washing lines are necessary. We produce plastic wash lines which effectively clean plastics from contaminants. Plastic washing plants start with crushing machines. We use wet crushing machines and washing process start inside crushing chamber. 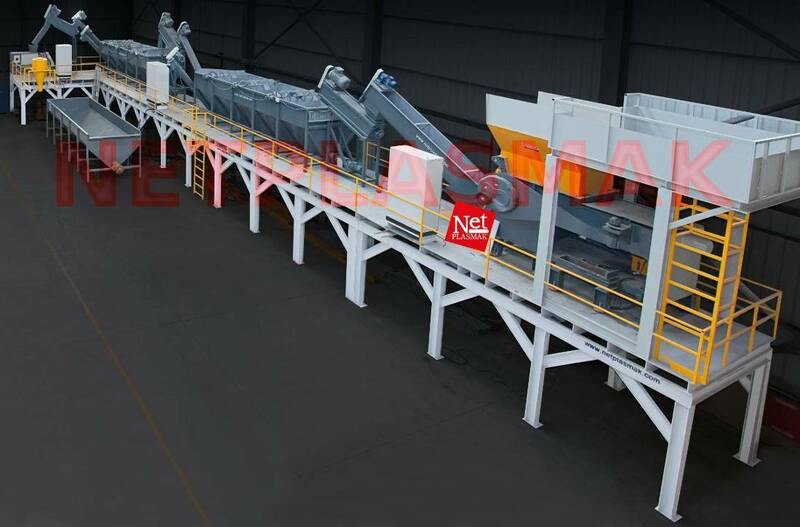 Crushing machine bring down the plastics entering into wash line into uniform size. High speed separator after the crusher removes excessive water along with dirt from plastic. Then, plastics get into washing pool. In the pool, while polyolefin types of plastics float, heavy contaminants sink to the bottom and are removed from the bottom by an auger. Floating plastics are removed from pool by a auger. Another high speed separator repeat water – dirt removal process. If contamination level of plastics high, a second pool – separator stage is placed for better cleaning. At the end of washing line, a drying process such as conical press, agglomeration or centrifuge machine is used.